Faced with myriad rules and regulations as well as evolving technology, today’s cancer registrars are being asked to do more than ever. Back in 1926, the first cancer registry was established at Yale-New Haven Hospital in Connecticut, where dedicated staff went about the business of collecting, managing, and analyzing data on individuals diagnosed with malignant disease. Today, cancer registries, an integral component of every healthcare system, play a vital role in deepening our understanding of cancer and its corresponding research and treatment. 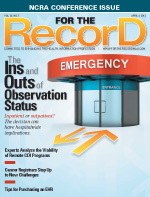 According to the National Cancer Registrars Association, cancer registries fall into three general categories: those within healthcare institutions that gather and maintain information on individuals who are diagnosed or treated for cancer at that facility; central registries, which collect and maintain cancer information within specific locales; and special purpose registries, which focus on collecting data for a particular type of cancer. Cancer registries typically collect patient demographics, medical histories, diagnoses, types of cancer, treatment and therapies, and follow-up care, including any ongoing treatment and disease recurrence. These data are then reported to the state according to each one’s respective reporting laws. States, in turn, report their data to the National Cancer Data Base (NCDB), which generates national cancer statistics and reports. Throughout the process, all patient information is kept confidential per HIPAA requirements, with no identifiers used in analysis or publication. Serving as an important public health tool, cancer registries enable public health officials to make decisions on activities such as research funding allocation, screening program placement, and educational program development. Further, the information is important to understanding treatment effectiveness and determining cancer occurrence and survival rates. Collaborating with physicians, researchers, and health administrators, cancer registrars oversee registry data management at various healthcare facilities. Cancer registrars ensure the information’s veracity and that all reporting is done in compliance with state and federal standards. Registrars generally collect data through coding summary sheets and pathology reports and from consults between radiation and medical oncologists, other facilities, and patients. Consults in particular have proven to be valuable resources. Cancer registrars agree that it’s important to keep open the lines of communication between different facilities. By law, cancer registrars must report to their respective states within six months of their facility’s initial contact with a patient. Hospitals also want to use the information concurrently, which means that registrars must coordinate all data and actively monitor the information for quality. The Web-based reporting system is designed to assist with local-level care coordination for patients with these types of cancers at facilities participating in the pilot program. Beyond that, Yates notes that Robert Wood Johnson’s cancer committee holds quarterly meetings. During these gatherings, the committee addresses different performance indicators and quality studies. In addition, it monitors all cancer registry functions, and the quality control coordinator, usually a physician, reviews data for accuracy. With a vast amount of data to collect and abstract on top of a wide range of other responsibilities, cancer registrars face numerous challenges. Additionally, registrars stress the importance of ensuring that information is as clean and error free as possible before submitting it to the state and the NCDB. They note that facilities are experiencing an increased demand for more current data and that any changes in software, coding, and requirements mean that they must stay up-to-date on the latest technology and guidelines. Keeping up with all the changes swirling around cancer registry and healthcare as a whole is a Herculean task, but there are solutions to help registrars maintain their sanity.